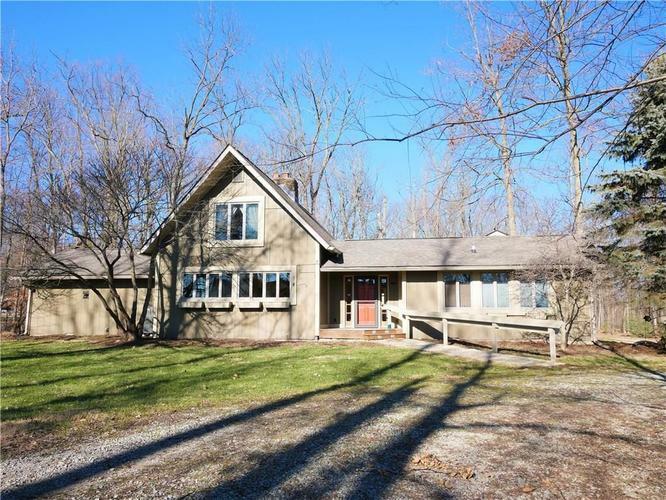 Amazing, Park-like setting for this 4 bedroom, 3 full bath home on 2.85 acres! Easily entertain in this sun drenched kitchen with SS appliances and tons of counter space! Cozy up to the stacked stone fireplace in the family room which boasts a vaulted ceiling! Enjoy the courtyard in the middle of the home which is wired for your own hot tub. Or enjoy the airy sunroom overlooking the expansive deck and large backyard with plenty of room to roam and play! MB has great view of the trees! 2nd Bedroom has it's own full bathroom! Garage has extra storage, potting shed, and a huge 35x17 bonus room upstairs that's heated & cooled! So many updates, including: Dual-fuel HE furnace w/ humidifier, dimensional roof, RO system, whole house generator. Directions:I-65 to Zionsville Exit/SR-334. East on SR-334 to CR-650 (1st traffic light). Turn left (N). Turn left (W) at Stop sign (Pierce St) & follow to woods on left. Follow Signs to Home in Back.